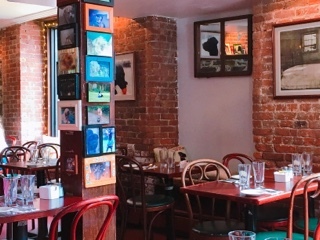 During our wanderings along the Upper West Side, we hoped to find a low-key brunch spot. Having just picked up cat treats and toys from a neighbouring pet store, a meal at Fred’s was a serendipitous coincidence. The restaurant is made for animal lovers, in particular dogs. Named after a female Labrador retriever, Fred’s is run by the Guiding Eyes for the Blind organization, which breeds dogs to act as guides and companions for the visually impaired. Animal pictures are plastered on the walls and beams, likely each filled with their own story. True to their mission, the establishment exudes a playful spirit, and some indoor tables even feature a couch for your furry companion. Alas, there were no dogs or cats inside (they were on the patio) during our visit. 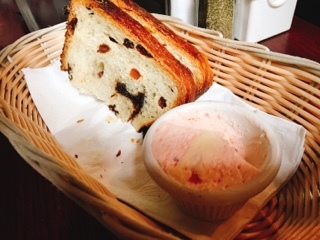 While waiting for our dishes to arrive, a basket of cinnamon bread comes first (there were actually four slices, we ate two before I realized they were worth mentioning). They don’t look like much, but upon biting into them, you find a lovely swirl of sugary cinnamon throughout and the butter and strawberry cream cheese spread makes it even better. Turns out, the bread’s sourced from Orwashers Bakery, which is well known for their artisan breads. It’s even used as a base for Fred’s French toast – for those who want this tasty ingredient to play an even bigger part of their meal. The huevos rancheros ($15.95) was fantastic. 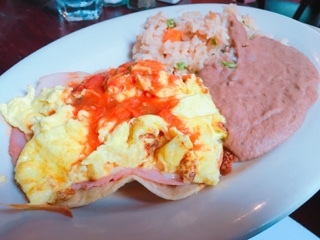 A crisp corn tortilla is layered with salty Black Forest Ham and gooey Monterey Jack cheese, then topped with two eggs (in my case, scrambled) and a lovely roasted tomato salsa. The eggs were fluffy without relying heavily on oil or cream, so they actually taste like eggs. As you cut through the rest of the ingredients and add a smear of the refried beans to the fork, it’s a lovely bite. With a hefty helping of rice on the side, the dish kept me full well into dinner. 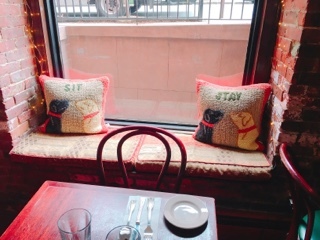 Fred’s, like a four-legged friend, has a comfortable cute quality to the restaurant. The dishes aren’t fancy, but they’re tasty and filling, and the large restaurant means no wait and you can eat unhurried. If only there were a couple of pets inside the restaurant, think they could have been seduced by a spoonful of refried beans?